The toys in this section are for medium sized birds. Many toys are interchangeable between sizes so please read the descriptions carefully as the images are for representation only. Please remember: Always supervise your bird with new toys and inspect old toys regularly for worn or frayed parts. A stimulating acrylic toy. Strong enough for my blue front amazon. He's been playing with this toy for days without a nick off the toy. I wouldn't have believed it if I hadn't seen it for myself. They love holding this toy and shaking it constantly. Gives great rattle sounds. This is a cool toy!! Large wiffle ball man with lots of swinging orange and yellow golf balls, porcupine balls, plastic keys, beads, baubles and colorful plastic pieces strung with Pauley rope and two bells for noise. All on a stainless steel pear link. 3 wiffle balls loaded with large and small hex blocks and plastic beads, topped off with a seagrass basket hat on a 1/4 inch vegetable tanned leather strip. All on a stainless steel pear link. 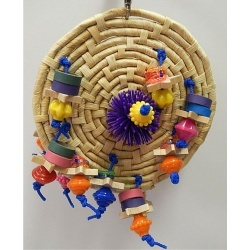 Seagrass basket decorated inside and out with wood shaped flakes and buttons, birdie bites, plastic round beads and small heart and flower beads all on pauley rope with a stainless steel pear link included. Lots of surprises to search for here! Three layers/sections of preen and playing fun. First layer has colorful beads strung on cotton supreme, second layer has colorful plastic keys strung on cotton supreme and bottom layer has barrel beads strung on cotton supreme. Center has large porcupine ball, birdie bit tube with several 2 inch birdie bites and plastic resuseable and moveable discs. Whether preening or playing, your bird will be entertained for hours. Your bird is going to love blast off. 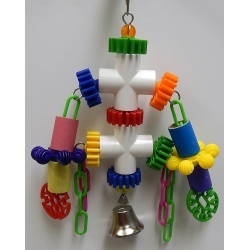 Plenty of sunburst wheels to spin, a bunch of bagel bites to chew, leather strips to tug on, many colorful assorted plastic beads, pacifiers and plastic links to play with, colorful wood pieces and wood blocks to chew and a stainless steel ringing bell. Do not let your bird be caught with his bloomers down!! 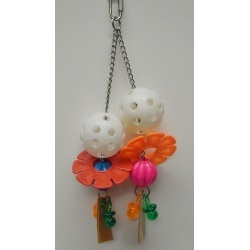 Not one but two wiffle balls, durable and bright daisy rings, over sized marbella beads. And did we forget to mention the veggie tanned leather and pacifiers as the side dish to this magnificent entree. You can easily add more wiffle balls if your bird destroys these. Carousel toy is a colorful spinning fun toy. Lots of pacifiers, stainless steel washers, wood and baubles to entertain for hours. Hardware is stainless steel. This toy base is pvc pipe with lots of sunburst wheels, plastic stars, flakes and chains and cardboard tubes to chew on. It also has a big bell to grab your attention. This is a strong toy! An 8" maize mat with wooden stars, birdie bites, porcupine balls, fancy beads, all hanging from pauly rope. This is a double sided toy---double the fun! 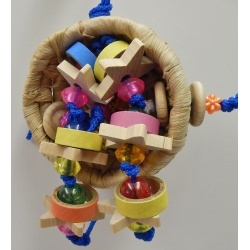 This toy has plenty of colored soft wood blocks attached by leather and plenty of colored sisal rope to play with. A clank and chew wooden toy. Wooden pegs, wooden blocks and fancy beads on cotton supreme. Wiffle balls strung with sisal rope, birdie bagels, colorful wooden blocks, plenty of colorful chew tubes with a bell for more activity, all on paulie rope. Sisal and paulie rope on one toy with lots of wood to chew!! Stainless steel pear link included. A birds gotta chew and this toy has plenty of chewing power time. Jam packed with thin pine slices, birdy bites and tubes, beads and baubles, on veggie tanned leather with two bells accented with cotton supreme preening rope. All kinds of choices here. Lots of reusable parts on this toy! 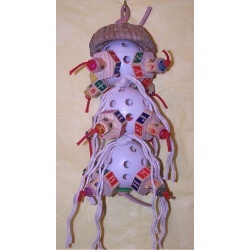 Large heavy duty dice topper with many strands of vegetable tanned leather threaded through a large plastic colored center ball, loaded with plastic spools, beads, pacifiers, stars and wooden blocks for chewing fun. Cotton supreme strands for preening. All on a stainless steel pear link. Preen and play toy. 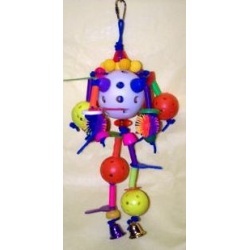 Allow your avian friend to indulge with this delightful toy filled with over 55 various toy parts consisting of hardwood bowls and colorful shapes to nibble on. Knotted with 100% natural cotton rope. Heavy Plastic toy spoons for the birdie that likes to feed himself. Use also as a toy making part. 4 legs of 2 inch hardwood wheels, natural wood blocks, beads and baubles, all on vegetable tanned leather strips. Combination of hard and soft woods. Groovy pieces of wood strung on rolled paper rope and held by a chain. Hide some small treats inside the grooves to make your new toy even more interesting. 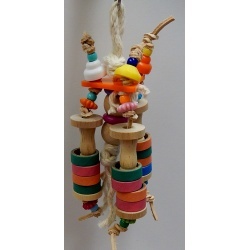 Colorful wood pieces, shapes stacked for picking and chewing/preening fun for your parrot. 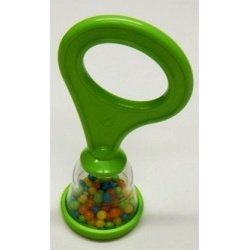 Your bird will love this toy and it has a reusable acrylic base!! Three legs of vegetable tanned leather, wooden circles, bagel bites, bright colored plastic beads and a wooden bail handles. The middle has two wooden balls and plastic circles. Oh my! !